Abstract. This study presents the results of the Fourth Filter Radiometer Comparison that was held in Davos, Switzerland, between 28 September and 16 October 2015. Thirty filter radiometers and spectroradiometers from 12 countries participated including reference instruments from global aerosol networks. The absolute differences of all instruments compared to the reference have been based on the World Meteorological Organization (WMO) criterion defined as follows: 95% of the measured data has to be within 0.005±0.001∕m (where m is the air mass). At least 24 out of 29 instruments achieved this goal at both 500 and 865nm, while 12 out of 17 and 13 out of 21 achieved this at 368 and 412nm, respectively. 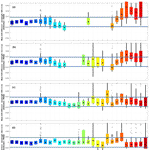 While searching for sources of differences among different instruments, it was found that all individual differences linked to Rayleigh, NO2, ozone, water vapor calculations and related optical depths and air mass calculations were smaller than 0.01 in aerosol optical depth (AOD) at 500 and 865nm. Different cloud-detecting algorithms used have been compared. Ångström exponent calculations showed relatively large differences among different instruments, partly because of the high calculation uncertainty of this parameter in low AOD conditions. The overall low deviations of these AOD results and the high accuracy of reference aerosol network instruments demonstrated a promising framework to achieve homogeneity, compatibility and harmonization among the different spectral AOD networks in the near future. How to cite: Kazadzis, S., Kouremeti, N., Diémoz, H., Gröbner, J., Forgan, B. W., Campanelli, M., Estellés, V., Lantz, K., Michalsky, J., Carlund, T., Cuevas, E., Toledano, C., Becker, R., Nyeki, S., Kosmopoulos, P. G., Tatsiankou, V., Vuilleumier, L., Denn, F. M., Ohkawara, N., Ijima, O., Goloub, P., Raptis, P. I., Milner, M., Behrens, K., Barreto, A., Martucci, G., Hall, E., Wendell, J., Fabbri, B. E., and Wehrli, C.: Results from the Fourth WMO Filter Radiometer Comparison for aerosol optical depth measurements, Atmos. Chem. Phys., 18, 3185-3201, https://doi.org/10.5194/acp-18-3185-2018, 2018. Aerosol optical depth measured from ground-based sun photometers is the most important parameter for studying the changes in the Earth's radiation balance due to aerosols. Representatives for various sun photometer types belonging to individual institutions or international aerosol networks gather every 5 years, for 3 weeks, in Davos, Switzerland, in order to compare their aeorosol optical depth retrievals. 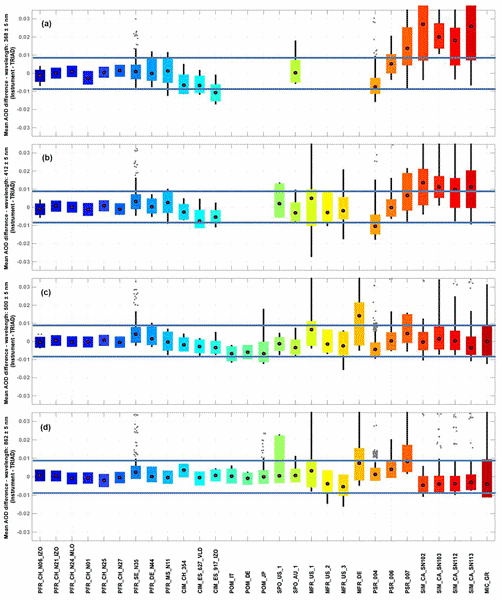 This work presents the results of the latest (fourth) filter radiometer intercomparison.